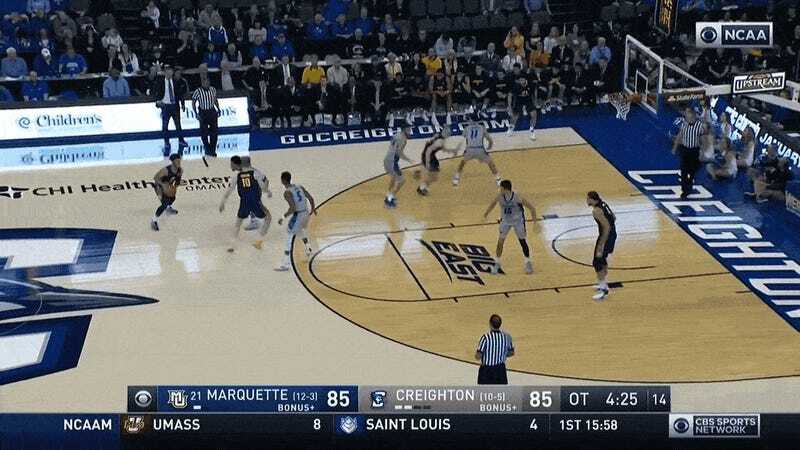 It was a miracle of a shot from Marquette’s Sam Hauser that sent the 21st-ranked Golden Eagles’ game against Creighton into overtime on Wednesday night. 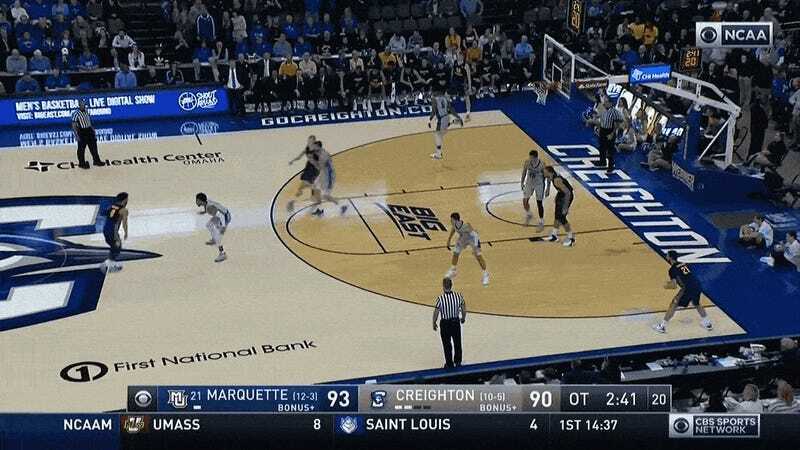 But it was the guy who inbounded and assisted on that dramatic buzzer-beater who utterly dominated the proceedings, and who did the most to get Marquette a 106-104 road win. 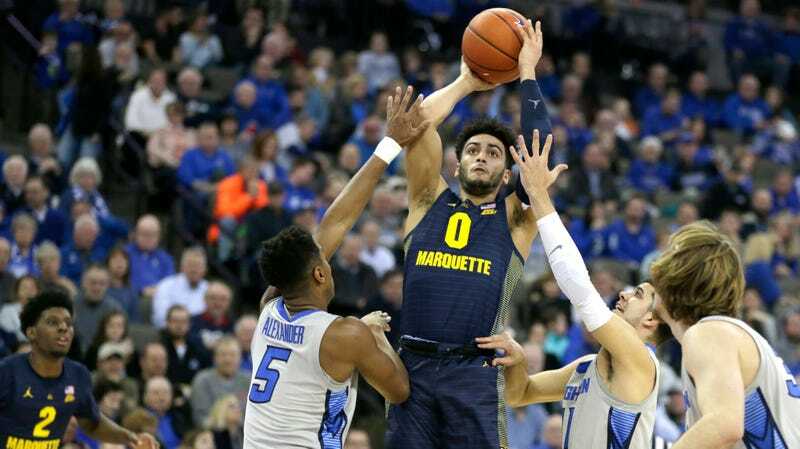 That would be Marquette point guard Markus Howard, already the proud owner of two 45-point games this season and a 52-point game last season, who scored a career-high and Big East record 53 on a ridiculous 15-of-26 shooting night. It was a remarkable showing, but more remarkable still is the fact that it’s become something like normal for Howard. Howard’s confidence and his unbelievable accuracy from three-point range—he went a preposterous 10-of-14 from deep on the game—was on full display against Creighton. 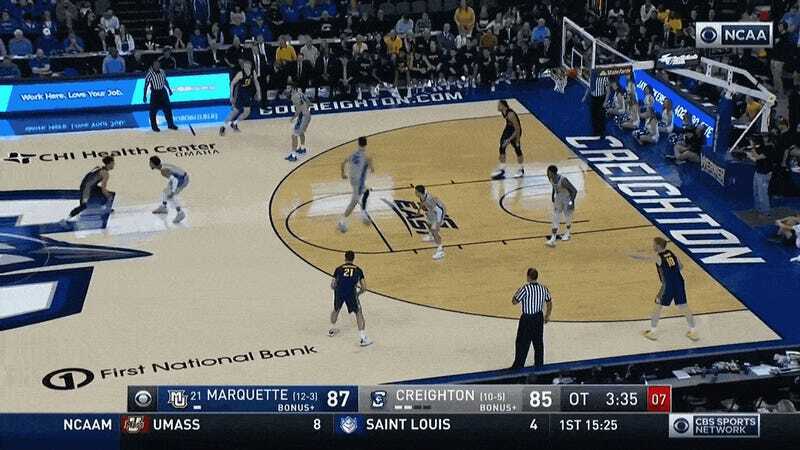 If anything, that somehow undersells Howard’s merciless and comprehensive destruction of Creighton’s defense, on both a physical and a psychological level. No matter which Blue Jay switched onto him, Howard picked him apart with his combination of a bulletproof handle and the ability to score from anywhere on the court. 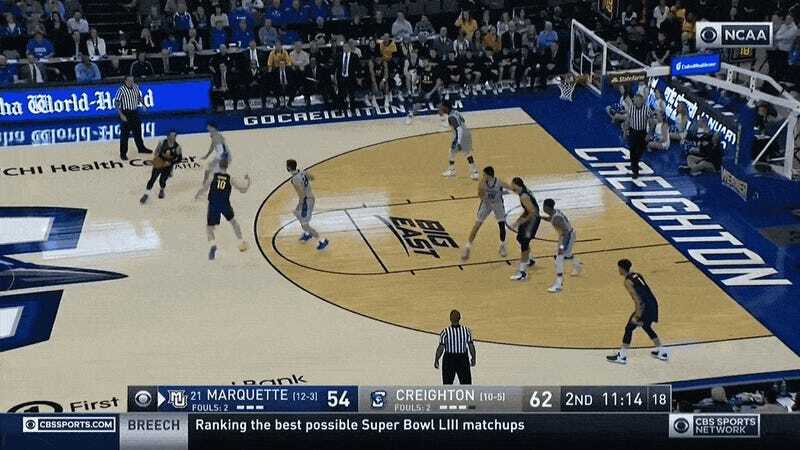 The 5-foot-11 Howard has been disrupted by some taller defenders in Marquette’s losses, but he was ready and willing to inflict punishment on every opponent last night. Here is the 6-foot-5 Mitch Ballock getting absolutely carved up by a gorgeous crossover that let Howard speed into the lane and hit a floater. 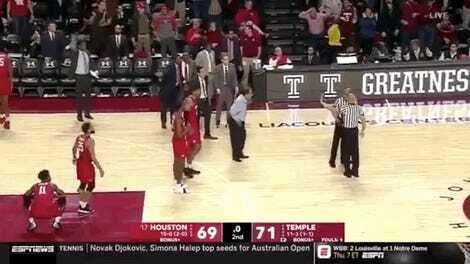 In OT, where Howard scored 14 of his 53 points, the 6-foot-4 Ty-Shon Alexander somehow looked even more helpless on what was basically the exact same move. No one had it worse all night than starting Creighton point guard Davion Mintz, who, try as he might, just could not avoid giving Howard the separation he needed to knock down shots. The jury’s still out on whether Howard is more Steph Curry or Jimmer Fredette, and the junior guard probably projects as a second-round pick at best if he tries his luck in the NBA this spring. But whether it happens in the pros or in the Big East or somewhere in China, I want Howard’s specific method of posterization to continue on forever—or at least until all defenders everywhere get the message and just starting giving up. What&apos;s Wrong With North Carolina&apos;s Nassir Little?